It is obvious that we are in the grip of a recession. This creates an opportunity for investors to capitalise on the recession and enter the property market. The burning question for the over-50s is "where will the baby-boomers trade down to from Auckland?" If you anticipate this correctly you will prosper. The main ingredients required for an ideal retirement city are a good hospital, flat land (porous and immune to flooding), good-value-for-money housing, golf courses, fishing, centrally located and an international airport. 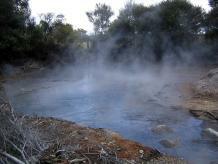 My pick is Rotorua. Where do you think the Jafas will gravitate to? By the way, Rotorua has the bonus of thermal hot water and heating, in places, for as little as $210 a year. With power price surges, this is extremely appealing. Economical living will be the key in retirement. Mary Holm: Firstly, we are not in a recession any longer - at least by the economists' definition. Still, property is not exactly booming, so I take your point that now might seem a good time to buy - if you can correctly predict where prices will rise fast. Everyone knows the boomers will retire in the next few decades, and that Rotorua will look attractive to many of them. It's likely that those factors are already reflected in property prices, pushing them higher than if the city were unattractive and there had been no baby boom. Whether property prices in Rotorua will shoot up particularly fast in future, then, is far from certain. And the same could be said for any other likely spot. P.S. I notice your email address includes something about Lake Tarawera. Would it be uncharitable of me to wonder if you just might be trying to drum up interest in a delightful property you happen to own?